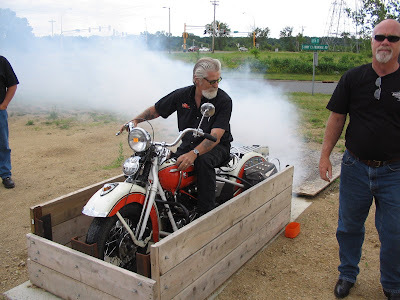 Neil Ryan, owner of American Thunder Custom Motorcycles in Savage, MN, held his annual open house this past Saturday. (if you have trouble finding it, it is right next to Lee's Speed Shop) Though the morning brought heavy rain, it was short lived, and gave way to partly cloudy skies for the afternoon. Doubtless this weather kept a lot of people away, but those who attended attempted to make up for it with enthusiasm. 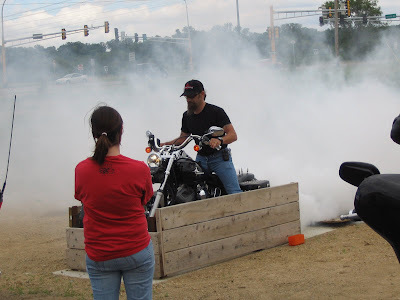 Besides some GREAT barbecue pork sandwiches the main attraction was a burn out contest conducted in the specially built "pit". 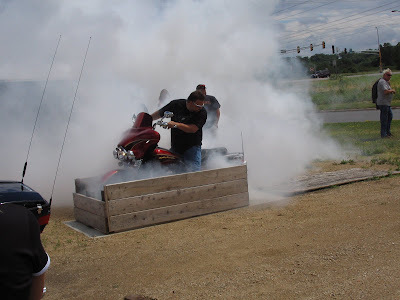 The $500 prize for the winner of the burnout contest was split between John, shown here on his 110 inch Twin Cam, and Ray with his Evo. Last night as I was stamping numbers into a set of heads that I was preparing to port, I realized that I had reached a milestone of sorts. This set of heads will be the 800th set of Harley heads that I have ported and flowed in the 19 years that I have been doing this work. I have to say that I was a bit surprised to see how many Evolution heads I have done compared to Twin Cams. I guess it makes sense though; Twin Cams have only been in existence for half of that time. Among the next 800 sets, I hope to do more Knuckleheads and Shovelheads. The Knuckles because I would like to do more R&D on them to see just how good they can be made to flow. The Shovels ....well, I already have some new ideas that I would like to try out. 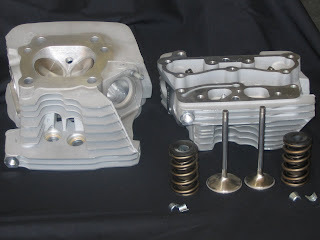 Modern equipment including the latest in wet flow technology should reveal some untapped potential in these antique castings. This past Sunday morning I had the privilege of preaching in our church because our pastor was out of town. The father son relationship between David and Absalom at first may seem an odd topic for a Father's Day sermon, but here is the shortened version. David's son Absalom took vengeance on his half brother (and David's first born) by killing him. Absalom burned Joab's fields just to get his attention. Absalom "stole" the hearts of the men of Israel so that he could take David's throne. Absalom "took" David's concubines in the sight of the people to humiliate David. Absalom sought to kill David even after he had taken his throne. We are Absalom. You and I have been not a bit better than Absalom in how we have treated our heavenly father. Any time that we put our own will ahead of God’s will, we have tried to take his place. Anytime we place our own desires above God’s desires, we attempt to sit on his throne. Which of us has not been disobedient to God our Father? Which of us has not tried to usurp his throne. Ever since Satan tempted Adam and Eve with the promise that they could be as God, every person born has likely been tempted to place themselves on God’s throne in his place. Has not God, like any good father, set out rules for us to follow? Are we obedient? Matthew 22:37-38 .....Thou shalt love the Lord thy God with all thy heart, and with all thy soul, and with all thy mind. This is the first and great commandment. How many of us can say that we have even begun to keep this commandment. Any time we willfully and knowingly commit a sin, we are saying "I love myself more than I love God"! And by saying that, are we not conspiring like Absalom to sit on God’s throne is his place? This great commandment is so important, and yet so beyond our ability to keep. And if you think you fare better in keeping some of the lesser commands, you likely need to take a closer look at them. Personally, I have found myself to be guilty of all. Which of us does not have a problem with pride? How many of us are proud of our talent, proud of the quality of our work, or even proud of our looks? Just like Absalom who loved to have chariots and horses, and fifty men to run before him, we love to get the glory for the things we do. But what do we really have to be proud of? What do any of us have in the way of talent or position or possessions that we did not receive from God our Father. And yet we seek our own glory as if we gained these on our own or by our own merit. But God says he will not share his glory with another! "O my son Absalom, my son, my son Absalom! would God I had died for thee, O Absalom, my son, my son!" David loved his son Absalom. Loved him to the point that he stated that he wished he could have died in Absalom’s stead. Can’t you hear that same mournful tone in both of these. David mourning for the son who had sinned against him so constantly. Jesus mourning for unrepentant Israel who sinned against him so constantly. So, if God mourns for those who have sinned against him, why does he not simply forgive all those who have offended him? Because he is as much a Holy God as he is a merciful God. His being a God of love is not at the expense of his being a God of justice. Because he is Holy, he cannot lower his standard of justice in order to be merciful! A perfect justice requires a penalty for lawbreaking. In order to be a loving and merciful God, it was necessary that someone pay the penalty for sins. Jesus paid that penalty for our sins. He did for us what David could not do for his son Absalom. What a great and loving Father we have! Despite how we have treated God, and though we are no better than Absalom, he sent his son to suffer and die a cruel death on the cross. That is our Father’s love! Reports have come flooding in over the last few days from the various local racers that carry the "Lee's Speed Shop" name on their bikes. All Good news, too! Local flat track legend Billy Hofmeister called me Saturday to let me know that he had cruised to an easy victory at the most recent Raceway Park event on his Rotax. Billy also reported that the rider he put on his iron head XLR found out that the bike will now run way more rpm than ever before. Apparently the bike would not go into 3rd gear, but they found that it was still pulling in 2nd at the end of the straightaways. It's a good thing I put heavier valve springs on it to go along with the porting work! This morning Joe Lieske stopped in with a great big drag racing grin on his face. He had been at Brainerd International Raceway this past weekend with his "practice bike", a V-Rod Destroyer. After getting his competition license (to run under 10 seconds) last time out, this was his first outing in real competition. He had a good weekend, making it all the way to the semifinals. Looking over his time slips this morning, I saw that he cut a .005 as well as a .007 light. Running low 9.90's at 127 mph despite being on the rev limiter 150 feet before the finish line, not too shabby. He left here to continue his quest to locate the software to enable him to change the rev limiter (back ordered from Harley - go figure). Last but not least, Jason Clampitt called me shortly after Joe left, to give me his good news. He and his Sportster dragbike made it to the finals at the Divisional race that he attended recently. And if that is not enough, he turned in one of his best weekends ever at Brainerd this last weekend. It was a "double header" so he actually entered his bike in "Bike 1" and "Bike 2" for each race. That's a total of 4 races. Not only was his little Sportster running good, with a best of 9.91 and 132 mph, but he won a total of 16 rounds over the weekend! The results come down like this; one quarter final appearance, one semi final appearance, one runner up, and one first place finish! So, a big congratulations to all three of you, and a big thanks for keeping my shop's name out there! This past Sunday morning Pastor Voigt preached on "the prelude" to the sermon on the mount. Jesus is not preaching the gospel here. This is primarily teaching aimed at his disciples, that is, born again believers. As a born again believer, when was the last time you read through this greatest of sermons?